Although you may not believe it, Sicily gets cold. No snow, granted, but it's still in the 40s-50s F all winter long, and winter lasts from late November to late March. I'm concerned about keeping our newborn baby boy warm and cozy this winter. During our time here in the States, I have been buying up warm winter things, such as this darling little fleece bunting (found it for $10... perfect indoor lounge wear!) and have finally begun making a couple things for him, too. I chose navy blue flannel for the inside of the blanket and a blue-and-red plaid for the outside. We began by drawing a curved shape on a folded square meter of flannel. I then cut along the shape I'd drawn. Proof that we followed the tutorial every step of the way! The fabric now has the shape that my final product will take. 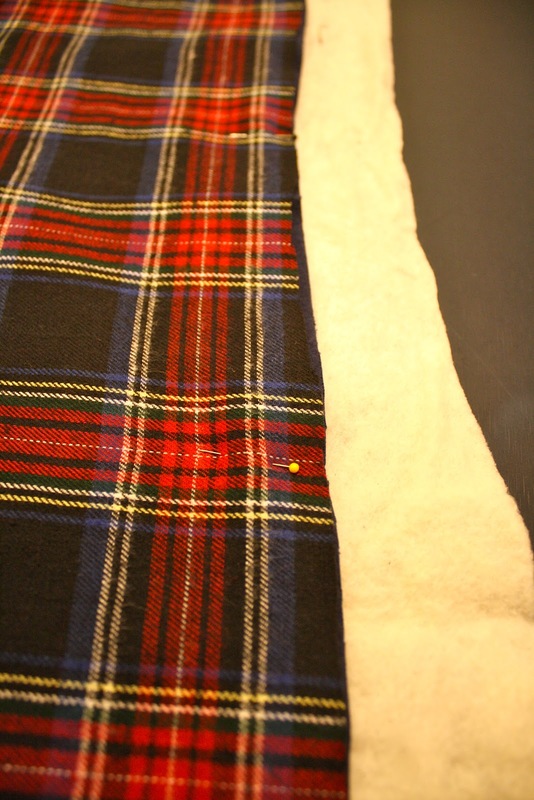 We laid the flannel pieces out on top of some cotton batting and then flattened the flannel onto the batting. Note: We might have seriously damaged the ping pong table as we ironed on it. Be a little smarter than we felt at 10pm that night and use your ironing board instead! A break to admire the kitty cat, Luna. 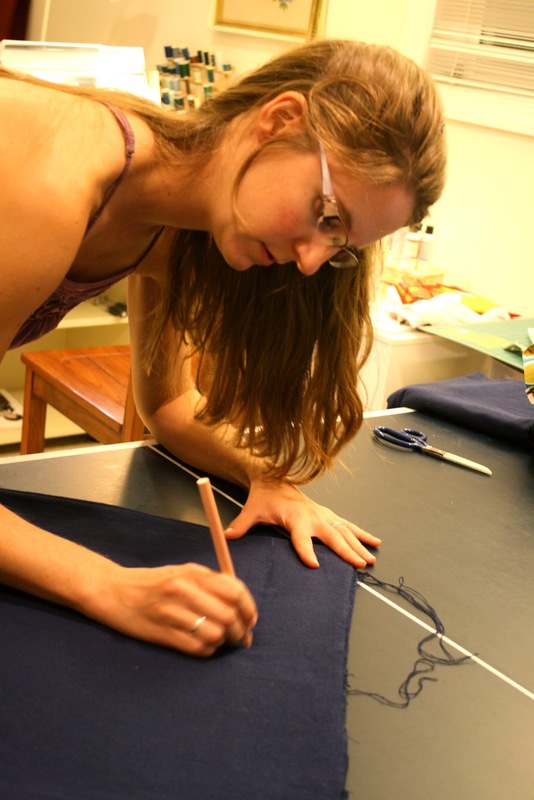 ... sewed a straight line across the top of one of the corners. This, when trimmed and flipped around, made a hood! So cute. We're almost done. I top-stitched around the entire blanket to give it a beautiful finished edge. Meanwhile my mom measured the distance between the straps in the car seat so that we could make holes in the blanket for the straps to fit through. More tracing and measuring. I then sewed around the markings. My mom used a rotatory board and cutter to slice along the marking lines we'd made. And that's it! 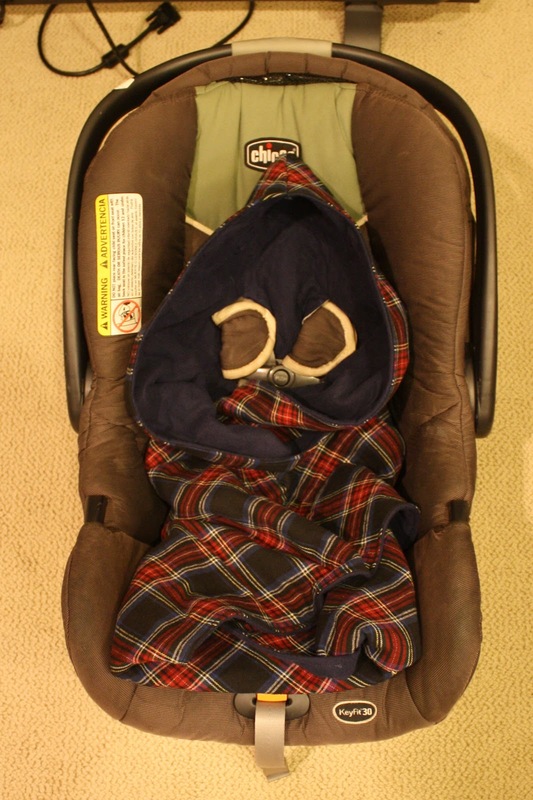 We put it into the car seat and the straps all fit through the openings we'd just cut in the blanket. The blanket will wrap around my little boy so nicely and keep him snug and warm in trips in the car all winter. Plus he'll look so handsome in warm plaid flannel! Now all I need is a baby to wrap up in it. Baby boy, whenever you decide you're ready around January 30, I'm so excited to meet you! What a great Idea! And adorable, too. But I'm not sure my skill level is up to par to make such a thing! If we have another baby during the winter months, I'll definitely try making one of these! Cute! I love the fabric you chose. 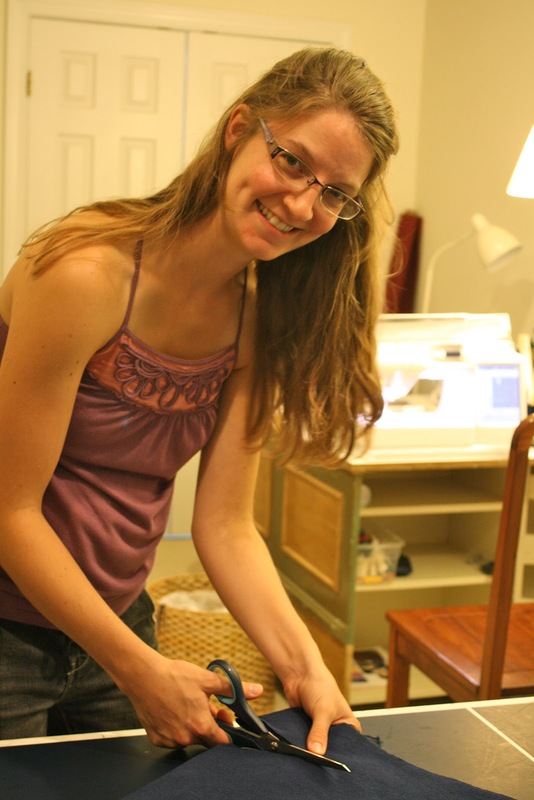 I think a sewing machine will be on my Christmas list this year. Great idea! Mine was a birthday gift from my mom a few year's back, and it's a refurbished Bernina. I'm sure it's about as inexpensive and reliable as they come, and it will keep running for years. Check a local sewing/fabric store. Oh my gosh, too cute! It tucks right into the seat. 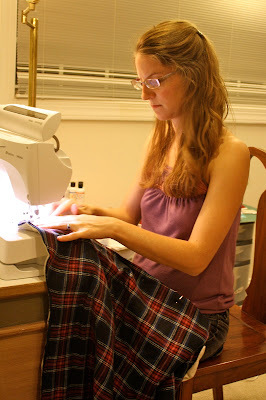 I'm dying to learn how to sew, but I'm so intimidated by sewing machines. One of these days I'll take the plunge! Believe me, Erica, I know the feeling! 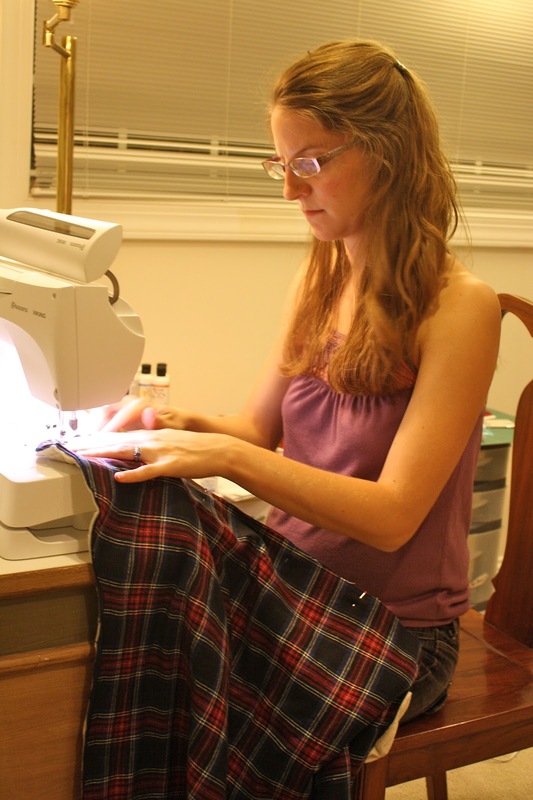 I do almost all my sewing with my mom and stick to knitting on my own. It shouldn't be that way after she raised me around a sewing machine, but... there it is. It's great! Love it. It's funny I have a friend that lives in Paris whose baby is also due on the 30th of January and it's also my mum's birthday - a good date I'd say! Cute! You Green ladies are so crafty. Job well done! I love this! One of my favorite professors and favorite women ever had her latest baby in one of these when I first saw him and I loved it. Also honey that you for your wonderful comment on my blog! After reading it I knew I had to get over here and see the awesome gal who wrote it! I like this. You make it seem so easy! Must share with my coworker! Your blog was very informative and descriptive. I like your blog and look forward for some more informative blog.